The bold force behind the Financial Districts rising social status, W New York Downtown upturns staid Wall Street expectations with radiating energy, just minutes from the Statue of Liberty, New York Stock Exchange, 1 World Trade Center and more.Experience. Influence. Enjoy. Taste innovative sips at the Living Room Bar & Terrace. Work up a sweat at FIT. Connect at WIRED Business Center. Or celebrate in our ample meetings and events space.Take it easy. Each of our 217 guest rooms and suites, spread over 58 floors, remixes signature W beds and creative amenities, like innovative technology, in-room entertainment and W MixBar. For everything else, theres Whatever/Whenever . Just ask. Explore the center of the universe. Wake next to the New York Stock Exchange, Wall Street and 1 World Trade Center at W New York Downtown. 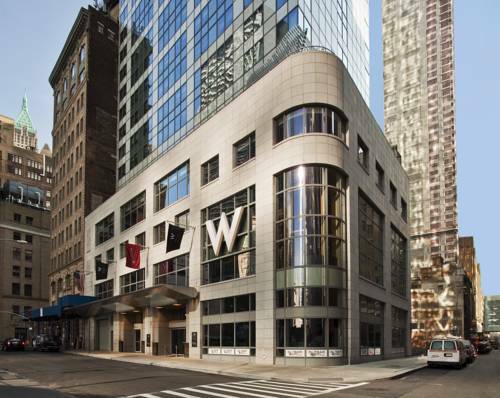 Step out the hotel door and discover more domestic and international headquarters in the Financial District than any other square mile in the world. Plus, Battery Park offers 25 acres of green space along the New York harbor, with views of the Statue of Liberty and Ellis Island, which are a mere boat ride away. South Street Seaport adds to the mix with colorful shops and local flavors. Moving uptown, Tribeca offers destination restaurants while the Meatpacking District pulsates with nightclubs, and Chinatown, Little Italy, Soho showcase New Yorks dynamic diversity. The city is like a real-time museum, layered with history, world-renowned institutions, designer boutiques, historic department stores, churches, and more all easily accessible on the subway, as are Times Square, Chelsea, the Upper East and West Sides, and Midtown. Catch a Broadway show. Enjoy a world-class meal. Stroll in Central Park. Watch the worlds top athletes at the citys landmark stadiums, home to the Yankees, Mets, Knicks, Rangers, Giants, and Jets. The options are endless. Hang out in the Living Room Bar & Terrace, illuminated by the glittering Manhattan backdrop. Step out onto the terrace for unobstructed views of 1 World Trade Center and groove to our cool beats. - Nomura Holding America Inc.